On such a widespread territory as Russia, where the railway network is very well-developed, trains are one of the main means of transport. Almost all the Russian train routes lead to the country’s heart, Moscow. If you come to Moscow, we advise to be well-informed, so you could get from one spot to another trouble-free, and delve deep into sightseeing. 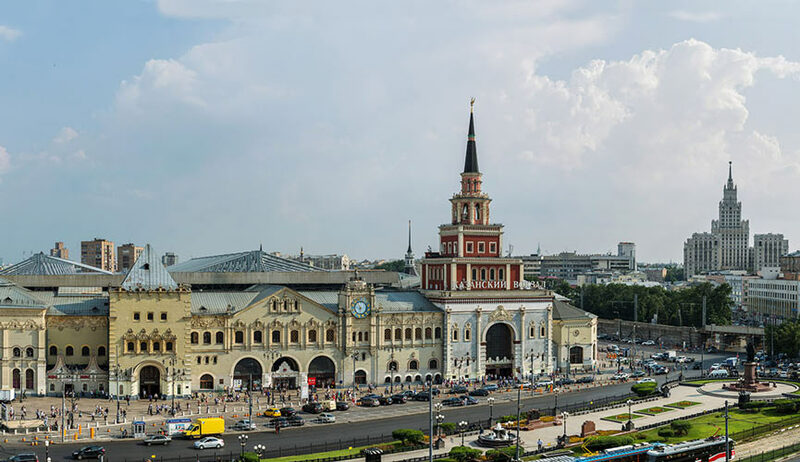 In this article we would like to get you acquainted with train stations serving domestic destinations only – Kazansky, Paveletsky and Savyolovsky. Below we reveal insights into the services each of them provides, routes, opening hours and more. Domestic destinations: east and south-west Russia: Kazan, Yekaterinburg, Ufa, Samara, Chelyabinsk, Makhachkala, Voronezh. Location: Komsomolskaya sq. 2, metro station "Komsomolskaya" (Ring or Red lines, north-east). Business-class Waiting Room at Kazansky Train Station desereves a special attention. It is known for its beautifully decorated interior. In 2010 the famous French designer Jean-Paul Gaultier, inspired by its architecture, chose this place to showcase his new collection, so there (just imagine!) was a podium and a red carpet. You can access it through the Waiting Room № 3. Moreover – and even not many locals know about that – there is an Art Gallery inside this train station building, where a permanent exhibition of works by a Russian painter Dmitry Belyukin takes place. It is located in the Tsarskaya Bashnya (or Tsar Tower), the entrance is through the Waiting Room № 3 or right from the Tsar Tower door at Ryazansky Proezd (the monument “Creators of Russian Railways” is next to it). It’s possible to visit the Museum by appointment on weekdays from 9 am to 9 pm (1 to 2 pm is a lunch hour). Сoncierge services (meeting at the platform and Porter service, Waiting room seat reservation, Ticket Booking and more): 3000 Rubles. This service can be ordered at the Business class waiting room. Domestic destinations: Domodedovo Airport Moscow (by Aeroexpress), south Moscow, west and south-west Russia: Saratov, Novorossiysk, Voronezh, Tambov, Lipetsk, Volgograd and Astrakhan. A huge building of Paveletsky Train Station consists of four areas – all them interlinked inside – and has four entrances. Please find below the services it provides. Information points at Paveletsky station: the general information desk (accessible via entrance #4) - on the left, and Aeroexpress train Information desk (accessible via entrances # 2 and 3) - on the right. Location: Paveletskaya sq. 1a, metro "Paveletskaya" (Green or Ring line, south). Domestic destinations: towns of Moscow Region (Oblast): Dubna, Lobnya, Iksha, Dmitrov, Savelovo, Kostino. Location: Savyolovsky Vokzal sq. 2, metro "Savelovskaya" (Grey line, north). Luggage Storage: 170 Rubles / per bag / per day. Automated Luggage Locker: 100-200 Rubles/first hour, 40-100 Rubles any next hour, 220-500 Rubles/day. all the fares and services data in this article is provided by Russian Railways staff and can be changed at any time, so please take it as an approximate reference. You have looked through this article but there was no answer to your question? Getting acquainted with Moscow seems to be not so easy? Please feel free to email us, so we could advise you, which sights and when to visit, which of them are must-see and more. Everything you need to do is just share your preferences with us, so we could arrange one of the tours in Moscow with our friendly Moscow tour guide that you will surely remember for a long time!